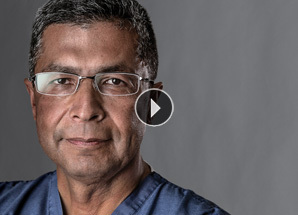 Daniel Lozano, MD, leads the team at the Regional Burn Center at Lehigh Valley Health Network. It’s one of the most progressive burn centers in the country and the only one in the region to offer pain-free burn treatment, even for third-degree burns. A burn trauma is among the most significant stresses the human body can survive. Daniel Lozano, MD, and his team are the only ones in the region offering pain-free burn treatment, even for third-degree burns over 80-90 percent of the body. We’ve treated more than 6,000 burn patients over the past decade. Lehigh Valley Health Network's Regional Burn Center is one of only 58 nationwide verified by the American Burn Association and American College of Surgeons. To receive this designation, a burn center must meet rigorous standards regarding personnel qualification, facilities, resources and medical services. This achievement recognizes our dedication to providing superior care for adults and children from the point of injury through the rehabilitation process. To achieve reverification in 2011, which lasts for three years, our Regional Burn Center underwent an on-site review by a team of experienced surgeons. The team used the “burn care” chapter from an American College of Surgeons’ manual as a guideline in conducting the survey. For the third time, our Regional Burn Center received no deficiencies, meaning all core criteria were met. For questions about burn surgery, call 610-402-CARE. Our burn care philosophy makes us unique. Our patients and families are an integral part of our burn team. We utilize modern burn treatments that provide as pain-free an experience as possible. We provide care that is culturally sensitive to meet the needs and expectations of our culturally diverse patient population. Our goal is to not only see you recover physically, but to have a truly meaningful recovery. We see more than 600 adults and children with serious, even life-threatening burns. That’s three times the number of patients the average burn center sees. We are the only burn center in our region with a medical staff dedicated to treating burns. The Regional Burn Center includes 18 private rooms with state-of-the-art infection control and private baths. Our two treatment rooms provide 360-degree access to the patient. Families presence is welcomed and encouraged 24 hours a day. Pain control technology called “Snow World” serves as a distraction during burn wound dressing changes and helps us achieve our goal of pain-free burn care. Our TeleBurn program, one of the world’s largest and most successful telehealth programs, ensures patients’ wounds are accurately evaluated by our burn specialists prior to their arrival in our Regional Burn Center. Our scar management program provides the latest techniques to limit cosmetic and functional disabilities. Our image enhancement services provide tattooing and instruction on makeup techniques for scarred skin. Our full-service Burn Recovery Center provides wound care, physical and occupational therapy, scar management, nutritional counseling and support services. Specialists here provide care during nearly 5,500 patient visits annually. We provide support services to help patients and families deal with the emotional issues that often accompany a burn injury. Our Regional Burn Center and Outpatient Burn Center is located near major highways in Allentown, Pa., making travel to and from to our facility easy and convenient.